I have no idea waht this is,...but it is motorized,..runs on alchohol,....and by the size: it looks like a 4 year old drives it at the solt flats. That just makes it too kewl in my opinion! 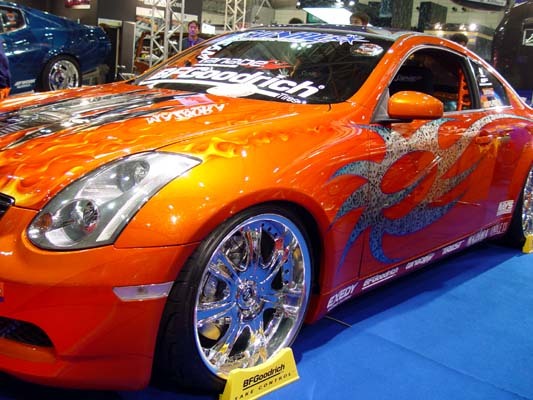 Another view of the Celica. 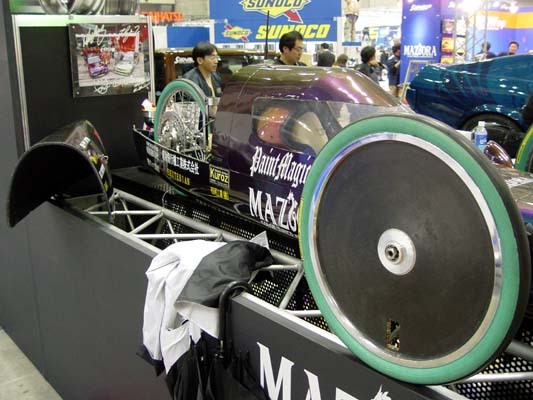 This thing was one killer rolling billboard for Maziora/House of Kolor. Even the logo on the hood is a combination of the two corporate logos: The dragon, and the scarab. It symbolizes the new partnership between Maziora/Nippon Paint, and Valspar/HOK in Japan. They are now the main distributor, and rep for HoK in all of Japan! These two rides got some serious press at the event, including mag coverage from a number of American magazines that were covering the show. 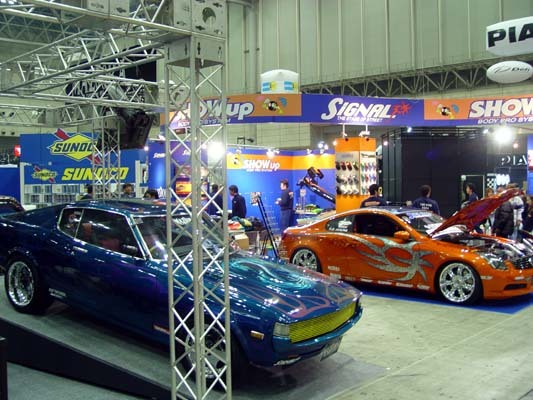 The hit of the show, The Signal Skyline is being shipped to California in March for trials, and actual Drift Racing. keep an eye out for it at a track near you! 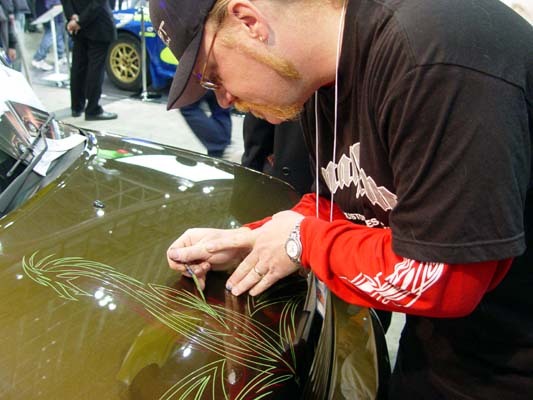 One of the final demos I did in the booth was to Pinstripe the new Maziora bB Scion. 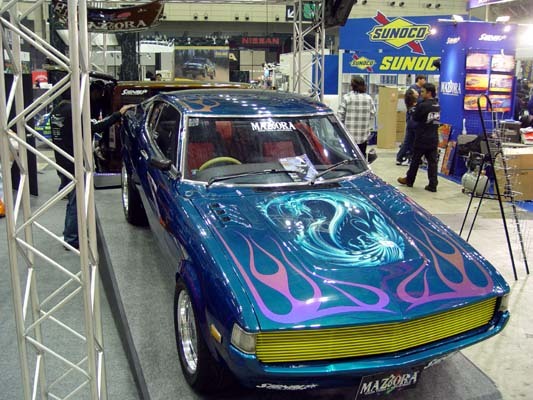 This Toyota is a limited edition available in Japan with the kustom Maziora paint right from the factory,...man,...We need a House of Kolor Mustang,...or something back home! All in all it was a successful trip, and the end result is a limited partnership between Signal/Showup, and Kal Koncepts/Air Syndicate. We are now the official instructors, and kustom painters for the company, and are currently putting together a curriculum for a master painters course to be offered through Showup in Japan. Keep an eye out for the cars, and paint in the states. We may be visiting Japan,...but Kal Koncepts/Air Syndicate is gonna remain a competitive force in Cali for a long time! 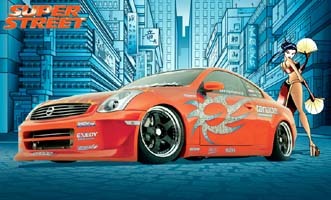 "CLICK BELOW TO CHECK OUT SUPERSTREET'S COVERAGE OF THE SIGNAL SKYLINE"